The Main parameters Tab is used to configure the monitoring process. It displays all the general parameters of an object currently selected in the Tree View and allows you to edit these parameters. The Main parameters Tab contains several sections specific to the object type: either a single monitor, or a group entity: an application, host, host group, agent, monitor category, monitor type, monitor status, and root. Each section can be collapsed to save screen space; Client application remembers and restores expanded/collapsed states for a given section. Disabled or inherited parameters are shown by the appropriate font (usually grey) and background. You can modify any parameter and either save the new parameter by clicking the Save button, or revert the changes by clicking the Cancel button. Keyboard shortcuts: Ctrl+S to save changes, and Esc to cancel. An Application group node Main Tab contains a specific section: ‘Application Template Monitors’. 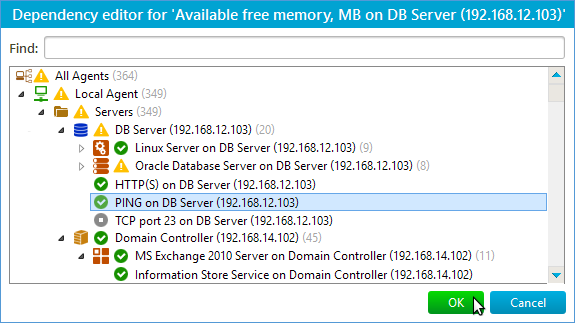 This section lists all the application monitors and allows to enable/disable them. You can use the following template parameters (monitoring system variables) in monitor and group object parameters. Using these variables reduces configuration efforts since you can define generic parameters that expand as necessary when used in particular monitors and alerts. For example, you can use the $MonitorName variable in the SMTP monitor test message subject to simplify sorting or searching of these messages on the receiving side. In addition, these variables can be used in Alerts parameters. The default FROM field for e-mail messages: the value of “From” email address setting for the primary SMTP server from E-mail page of Settings dialog. The alternate FROM field for e-mail messages: the value of “From” email address setting for the alternate SMTP server from E-mail page of Settings dialog. The default TO field for e-mail messages: the value of Email address setting from E-mail page of Settings dialog. Monitoring service account user name: the value of User setting from Credentials page of Settings dialog. Monitoring service account domain or host name: the value of Domain setting from Credentials page of Settings dialog. Monitoring service account password: the value of Password setting from Credentials page of Settings dialog. Passwords are stored in encrypted form in the monitoring database. The exact time when alert has been triggered. Monitor parameters: Display Name, Monitor Id (unique internal monitor identifier used in monitoring database), Notes, Link to Summary Report (regular version and version for mobile devices). If a parameter (for example, SMTP test message text) contains these variables, they expand to host parameters. 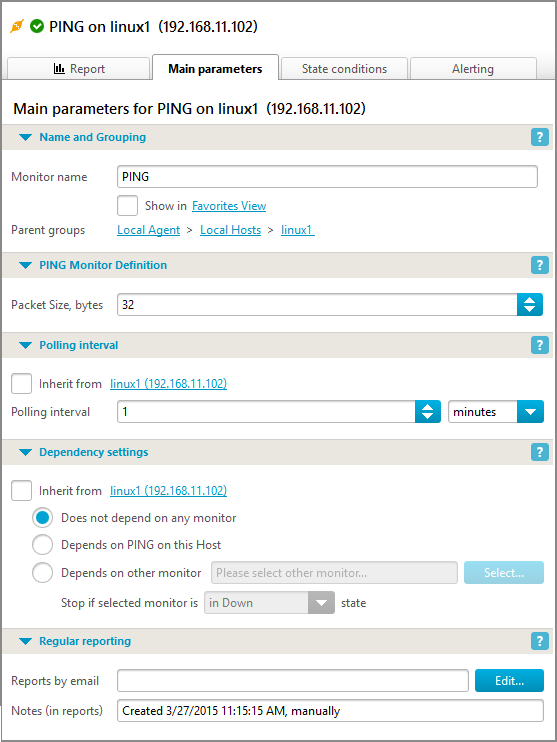 Host parameters for the parent host of a given monitor: Display Name, Host Id (unique internal host identifier used in monitoring database), Notes, IP address, DNS name, Link to Summary Report (regular version and version for mobile devices). If a parameter (for example, SMTP test message text) contains these variables, they expand to host parameters. Parameters of a given host group, either predefined or custom: Display Name, Notes, Link to Summary Report. If a parameter (for example, SMTP test message text) contains these variables, they expand to host group parameters. Parameters of a given Agent, either predefined or custom: Display Name, Notes, Link to Summary Report. If a parameter (for example, SMTP test message text) contains these variables, they expand to Agent parameters. Only for alerts – a short and even shorter descriptive text for the event or state change prepared by the monitoring service. Only for alerts – additional details about the event that occurred. Usually the error message returned by the monitor when a monitor state change took place or arbitrary data bound to the event that occurred. Only for alerts – the monitor state before a state change that triggered the alert. Only for alerts – the monitor state after a state change that triggered the alert. Only for alerts – the time when a monitor state change or event occurred. Only for alerts – unix time (epoch time) when a monitor state change or event occurred. Only for alerts – the length of time a given monitor was in current state. Only for alerts – the result of the last poll of the monitor. If the monitor is currently in the down state or has never been polled, the value is ‘N/A’. Only for alerts – the moment of the last poll of the monitor. If the monitor has never been polled, the value is ‘N/A’. Path to the directories where IPHost Network Monitor is installed and where its data is stored. 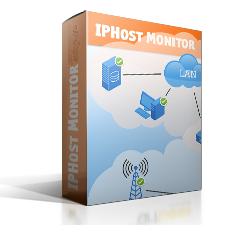 By default, ‘%ProgramFiles%\IPHost Network Monitor’ and ‘%ProgramData%\IPHost Network Monitor’. Can be used to set monitor parameters, for example, path to a script or program for ‘Script or Program’ monitor. Only for alerts – counts how many times alert has been triggered. Works only if the ‘Execute again’ alert option has been checked. Normally, $UnixAuthType equals to password and $UnixKeyPath / $UnixKeyPassphrase are undefined. However, for SSH monitors you can configure authentication by key or by both key and password; in this case $UnixAuthType changes to key, or key_or_password, respectively, and $UnixKeyPath / $UnixKeyPassphrase are set to the corresponding monitor parameters. Besides, $UnixPassword is undefined when using authentication by key only. For SNMP monitors and actions, these variables expand to corresponding SNMP credential fields. They may be used in other settings of such monitors / actions. $SNMPVersion takes the following values: v1, v2c, v3. $SNMPCommunity is only defined for SNMP v1/v2c credentials; other variables are only defined for SNMP v3 credentials. $SNMPv3Authentication takes the following values: none, md5, sha1. $SNMPv3PrivacyProtocol takes the following values: none, des, aes. Also, you can use Windows system environment variables to set monitor parameters, for example, path to a script or program for ‘Script or Program’ monitor: ‘%ProgramData%\MyDir\script.vbs’. The monitoring system resolves an environment variable as a user it is running as. 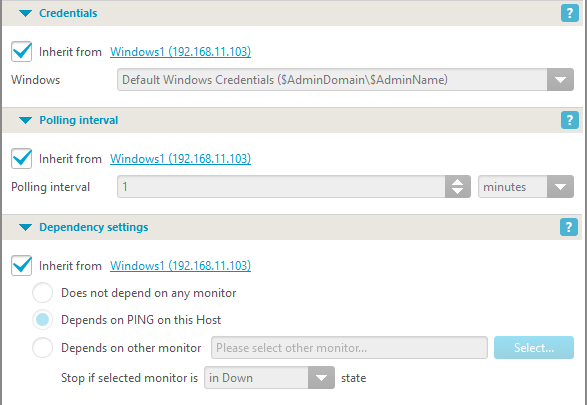 By default, the monitoring service is running as LocalSystem, so it uses the LocalSystem’s Windows environment variables. These variables are specified at “HKEY_LOCAL_MACHINE\SYSTEM\CurrentControlSet\Control\Session Manager\Environment” and at “HKEY_USERS.DEFAULT\Environment”. Make sure the variables you want to use are defined in one of those locations and they will be accessible. A monitor can inherit the Polling interval, Dependency settings and Credentials sections from its parent (host or application). By default, a newly created monitor inherits these parameters from its parent host or application and most of its Monitor Definition sections are filled with the parameters stored in its Monitor Type entity. The inherited parameters cannot be edited directly: you either need to uncheck the Inherit from checkbox or edit the parent host parameters. The given application also inherits these parameters from its parent host, the host also inherits these parameters from its parent host group; a host group inherits them from its parent Agent, and so on. Hence, it is possible to specify these parameters on any three level and to cause all the sub-tree entities to inherit them. Note that if you change a parent host parameters, all its children that inherit this parameter, will inherit the changed value immediately. Individual monitor parameters are described here. Group entity parameters (host groups, monitor types, monitor categories, states, and root objects) are described here.